SEFFNER  The bookends are clear in the life of Sinatra, a 5-year-old, brown-and-white, blue-eyed Husky. Beloved by his teenage owner and her parents, Sinatra disappeared after the girl died in a tragic gun accident. Then earlier this month, he wandered into a neighborhood where people tracked down his family and arranged for them to be reunited this Sunday. But Sinatra cant explain what happened in between  an 18-month, 1,200 mile journey that took him from his home in Brooklyn to the streets of Seffner. Neither can his owners or the family who found him. I didnt believe it at first, but when I saw the picture, I broke down in tears, said Lesmore Willis of Brooklyn, whose 16-year-old daughter Zion Willis died in the accident at a friends house in November 2015. The dog had been Zions constant companion. Rose Verrill, 13, found the dog wandering near her Lenna Avenue home in Seffner and her family launched a search with help from friend Jeanne Baldi. A local veterinarian removed an identification chip from Sinatra but couldnt recover much information. And I thought it was amazing about thirty years ago when my friend's dog made his way back home to Squirrel Hill, Pittsburgh, PA after escaping from a home he was visiting about fifteen miles away. This is rather different, to say the least. Seffer is a suburb just east of Tampa. "He ( Lesmore Willis-owner) figures that other people might have found Sinatra and taken him in over the months but that he just kept running away. Verrill said that whatever happened, shes pretty sure he didnt walk the whole way. On Sunday, a friend of Verrills will travel to Baltimore with Sinatra, and Willis will meet them there. Hey Mr. Willis, don't forget to remove that bone and those tendons off that drumstick before the good poochie feasts. Do you think this dog jumped on a long distance delivery truck or what? When a Siberian Husky is found wandering, it will be picked up by someone. RE: "A local veterinarian removed an identification chip from Sinatra but couldnt recover much information. They turned to the Hillsborough County Pet Resource Center and came up with a possible owners name and a phone number. But the name, Willis Les, turned out to be convoluted and number was wrong  just one digit off. A chip is useless if the people installing it can't spell or get the phone number right. It’s a possibility, however, I believe the dog probably went looking for his missing friend. Tragic story all around, with a somewhat happy ending. But as is always the case, never the same life as before the tragedy occurred. Exactly. We had a samoyed that escaped and ran to the other end of town. We found him in the nick of time: A lady had just popped him into the backseat of her car (he loved riding in cars) and was about to drive off with him. For the record, giving a boney drumstick to a pooch is just fine... as long as it is uncooked. It's the cooking that makes bones brittle and able to splinter that is the problem (destroys the small intestine). I've been feeding my now-12-yo golden raw chicken, with bones, all her life. Includes a LOT of chicken quarters and turkey necks over the years. That may be close, but he would have been going the wrong way. 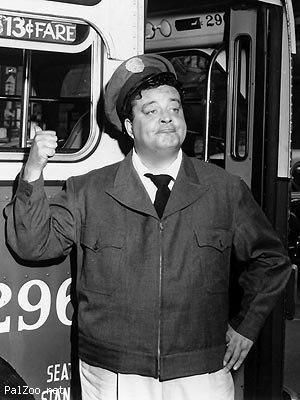 Maybe Ralph Cramden (Honeymooners) gave him a ride on his bus. "He did it his way." LOL................ post of the day! bigbob ......... you made my day! How do you think, in reality, that great dog got so far away from home?